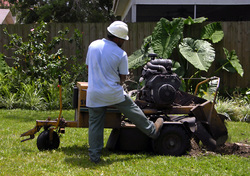 We also offer stump removal services along with our tree trimming service. Say for example a tree was to be struck by lightning and loom dangerously close to your home. Now, with nothing left to do but worry over your family’s safety there is only one thing left to do. Give us a call at League City Texas Tree Trimming where the only difference between us and the other guys is everything! We can send out our crews to cut down that tree that is threatening to damage your property. After we bring out our wood chipper and our tree cutters we safely and carefully feed the wood through our chipper where the wood is ground into biodegradable dust. Afterwards there is only one problem left. The stump that is left in the ground requires immediate removal! The stumps that are left from the removal of a large tree on your property can be quite an eyesore. Since you don’t want that stump remaining on your property doing nothing at all but waiting to trip you up, let us remove it for you. We can have our pros and our trucks move in after we take your tree down and then we can safely extract the stump from the ground. We even fill any hole or divot in on your property. It is, after all, the least we can do for you as a customer who is making the most of all of our on the site services. Stumps can leave long lasting and unsightly holes in your once perfect yard if professionals like us at League City Tree Trimmers do not remove them carefully and concisely. The purpose and speed of our stump removal service is to bring your yard back to a flat and clean look after the removal of any size tree. If you don’t think that any service can do the job of removing a huge stump then let us try it on for size. We have not found a stump that we could not beat with our patented process and our highly skilled professionals we make stump removal and destruction a breeze. Each tree we remove leaves that painful looking stump in your lawn where your kids play and your family barbecues. You know that with a job like this you might have to call in League City Tree Trimmers who have managed one of the best stump removal services in League City, Texas now for 25 years. Sometimes removing a stump can be a messy hassle leaving a homeowner feeling like he is in over his head. The task that once seemed like it would be easy becomes a whole family affair where 6 or 7 people including neighbors have to help you figure out to get rid of this stump! Wouldn’t you like to just skip through all that lost time and give us a call. In most cases we can have a truck to your residence in under a half an hour, making us the speediest stump removal service in the area.